Math info--we've spent many weeks learning to use various strategies for adding and subtracting one digit numbers and are working on 2-digit numbers! If you haven't yet, please send asap 20 nickels and 4 quarters to add to our dimes and pennies. We'll continue to learn to count coins (and identify them!) and you can practice this at home often. We are also soon working on time to the hour and half hour and fractions (equal shares). It's exciting how the children's skills have improved this year! You will see the latest STAR reading report, then at the end of May, the last one, along with an iReady report. Please send the pink permission/insurance note as soon as possible for the play, then for Sea World. If there is some reason your child will not go, please let me know ASAP. If you wish to accompany us as a chaperone, AND you are ALREADY approved, consider it a done deal! HERE is the link to pay for yourself and your child. Water bottle--please continue to send one with your child daily, even though it's not as hot. Thanks! iReady Math--I hope that over the break you encourage your child to complete some lessons on iReady Math, accessible through launchpad.lake.k12.fl.us. Jackets--Please put your child's name in his/her jacket- you wouldn't believe the lost/found sweaters/jackets/ lunch boxes that we have in our lost & found!! Your child knows his/her login and password. Reading activities are available in the Text Book tile, it's the ConnectEd McGraw Hill red and white tile. Also fun is GoNoodle.com- movement activities that we enjoy- you can too at home! Field Trip Volunteers-- During our informational meeting back in August, we told you about a change in which volunteers would now have to ride the bus if chaperoning field trips. Well, that has been changed back to the way it used to be--you can drive yourself as in past years. :) Also still in effect is that as a school chaperone, your responsibility is to my students, so none of your other children may accompany us. Would you like to keep up with your child's progress on AR? Here are the directions for doing so! Once you set it up, you use your child's AR login- lastname.first6lettersoffirstname and PW is 10 DIGIT STUDENT NUMBER. If you are checking out your child before dismissal for a Dr. appointment, please send me a note-either with your child that morning or via email by 8:30 so I'll see it in time. It takes time to get things together for your child to take home, and you'll just have to wait longer if you don't give me advanced notice. Thanks to those of you who already have done this! I appreciate it!! If you go to myportal.lake.k12.fl.us at home- this will give you access to our reading and math text books. The login is your child's tech login and the password is his/her 10-digit student number. I especially like the reading games that the kids can access on the Reading McGraw Hill app on My Portal. PLEASE Please read my link to the left "General Information." All the info there may answer some of your questions, or at least keep you informed. 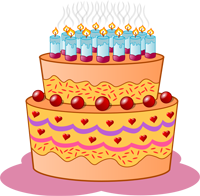 When a birthday arises, please give me a heads up if you wish to send a treat for the class. Please visit the HOME page calendar for LOTS of goings on at school! Happy April birthday to Anabelle!